Commercial roof replacement is something most business owners never want to have to think about — the kind of thing that haunts your dreams and leaves you in a cold sweat. It doesn’t have to be so bad — in fact, with spray polyurethane foam roofing systems (which we happen to specialize in), your business often doesn’t have to be interrupted at all while we install the system on top of your existing roof, replacing, of course, aged and weathered components. But I’m getting off topic — commercial roof replacement is something that worries most business owners, which is why knowing the signs of an aging roof is so important, even if your roof is the last thing on your mind. Roofs can last a long time — two, three, four decades, sometimes even longer — but when it’s time to replace, it’s best to get it done and get it done quickly before your leaking roof rots your wood deck or rusts your metal deck. I understand — you’re a bit busy running your business to worry about your roof. It’s hard to want to take the time to even walk your roof, because that’s time taken away from doing the work that really matters. I urge you to think a little bit differently about your roof — as an investment that protects your equipment and products. Roof replacement doesn’t have to be a painful process, but, the longer you’ve let your roof fall into decay, the worse the replacement process is going to be. That’s why I’ve compiled a short list of things to look for, signs that your roof is aging (or rapidly deteriorating). If you notice any of these signs, you’ll want to contact a roof replacement company right away. An aging roof is no joke. While you’re reading this, I want you to keep something in mind — there are many different types of roofs out there. I’m not sure it’s very useful to you if I were to list all the different types of roofs and what to look out for, but keep in mind that what I’ve got here is a list of the possible symptoms of an aging roof for many different types of roofs. Depending on the type of roof you have, you’re going to see different signs of aging that may warrant a roof replacement. To be completely honest, this is probably how most business owners are going to learn that their roof is aging or damaged — they suddenly notice a leak in the building. And just because you find a leak today doesn’t mean that the leak started today. 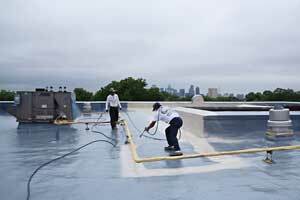 In fact, it’s often the case that the roof has been compromised for a while by the time the occupant of a commercial property finds a leak. It’s even possible for a leak to go for weeks or months without being noticed if the leak isn’t penetrating into open spaces or is hidden behind equipment or product. If your roof is leaking, it’s a good sign that your roof has some age-related issues. The difference between the severity and the number of leaks that a roof will have after a severe storm can differ quite a bit between a brand new roofing system and a roof that’s close to replacement age. While a leak is probably going to be the most obvious sign that your roof is aging and needs to be replaced, there are other visible signs of age that can be observed by walking your roof (or even that can be seen from ground level). (By the way, we’ll happily walk your roof for free and take a look at what’s going on). For some types of roofs, especially metal roofs, rust is a very obvious sign that the roof has been around for a while. 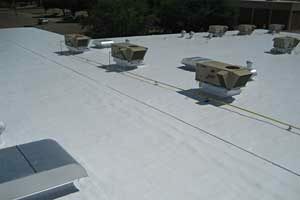 For other types of roofs, you may notice that blisters or bubbles are forming in the material that composes the roof. Just as concerning would be thinning — if the material that makes up the surface of your roof has become visibly thinner in some areas, or even discolored, that is a good sign that the roof is aging. Finally, you may find that the material is no longer pliable, that it has become stiff or brittle (or is even starting to crumble). This is another sign that your roof is aging. Other signs that your roof is ready for replacement include the formation of actual holes, tears, or cracks in your roofing material. Holes often appear after blistering and thinning becomes more severe, and the material can begin to contract around the edges of your roof. Cracks may also appear in certain types of materials, and the materials may begin to flake. You may also simply see general erosion or scouring on your building, where the material that makes up your roof has been blown off by repeated storms or simply blown off over time in an area with high wind activity. Finally, you may see buildup of grease or other unwanted materials on your roof — even simple dirt, dust, and plant matter can build up on a roof over time and cause issues. If your roof is leaking long enough, it can rot your deck (if it’s wooden) or rust it severely (if it’s metal). A major deck repair is going to be incredibly costly. If you think a little water getting into the building is bad, it’s nothing compared to a roof that has been let go for far too long and has started to fall inward. If you think your roof is ready to be replaced, we’d love to talk to you about your options. Click here to get a free estimate on a commercial roof replacement.